Grilling corn on the cob is easy if done properly. In this case I did it on the gas grill, but a charcoal grill would work just as well, probably better. The end result is sweet, caramelized flavor and a great presentation with the different tones of colors delivered by the grill. Below are the steps needed to do a great job. There is a video you can watch as well. I would recommend it. It was one of my first videos, so please go easy on me! Select Good Corn: At the basis of any good food preparation is the selection of quality ingredients. Buy the corn as fresh as possible, and for this recipe you need the husk of the corn still intact. Pull Back the Husk and Remove the Silk: The video will do a better job of explaining this, but you need to pull the husks back so they stay attached to the bottom of the corn, as you will be using the husk as protection against the fire. It is important that you get the silk out of the corn. Pull the Husk Back Over the Corn and Soak it: Fill a sink and soak the corn for at least half an hour, rotating it occasionally. 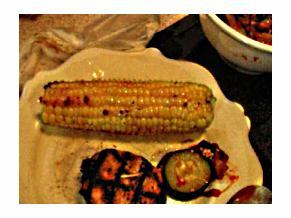 Preheat the Grill to Medium High and Place the Corn on the Grill: Stay with the corn. Even though you have soaked it the silk will still catch on fire. The browning of the husk will impart a smoky flavor onto the corn. You will be grilling for 20 to 30 minutes, turning frequently. Pull the Husks Off and Caramelize: This finishing touch will caramelize the corn and add the unique color tones and texture. Leave Grilling Corn on the Cob and Return to BBQMyWay Homepage.